It’s the ideal time of year to have an iPL treatment and undo any sun damage accumulated over the summer. During the treatment, you’ll wear special ‘eyewear’ to protect your eyes from the laser. Before treatment begins, an anesthetic cream will be applied to cover the treatment area. 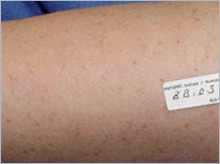 A treatment usually takes up to 30 minutes. Some patients may feel a slight discomfort with each laser pulse, described as feeling like the snapping of a rubber band on the skin. This mild discomfort resolves in a few seconds. Results vary from one person to another, but several treatments may be necessary to fully remove skin blemishes or spider veins. You can use a cool compress or gel pack if the treated area has any redness or swelling. Any discomfort should resolve within a few hours. As we approach autumn, it’s time to think about post-summer skin care. An ideal treatment for reducing or eliminating damage accumulated over the summer (and in past summers), is the IPL or Photorejuvenation treatment. During the treatment, you’ll wear special eyewear that protects your eyes from the light beam of the laser. 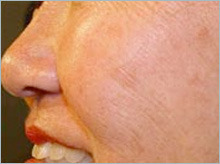 The treatment area will be prepared for the laser by spreading an anesthetic cream over the face or area to be treated. A treatment usually takes up to 30 minutes. You can expect the procedure to last less than an hour. There’s no recovery time, so you can back to work immediately, or if you have an event that evening, you’re good to go. There’s minimal discomfort – a mild tingling sensation is felt during the procedure – and no anesthetic is needed. Some people experience a healthy glow afterwards. October is the perfect month to start a series of IPL treatments to reverse some of the damage your skin has accumulated over the past summer months. IPL procedures cannot be done if you have a tan or have recently spent time in the sun. Used to lighten and remove sun spots, age spots, brown areas, and to reduce redness, rosacea, dilated and broken blood vessels on the face, neck and chest, IPL may also improve skin texture. The treatments can stimulate collagen production and may reduce pore size temporarily. The IPL laser produces a range of light waves, which target melanin (which is the pigment that produces freckles and age spots). The melanin pigment is then absorbed into your body, making it less visible. If you are undergoing IPL treatment for freckles, sun and age spots, the spots will darken within a day or two and remain darker for 3-7 days. Slight crusting may occur, which can last up to 10 days. 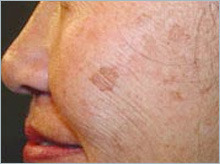 These spots or lesion will then begin to clear away and are usually gone within a few weeks. For best results, an average of 3-5 treatments is required. 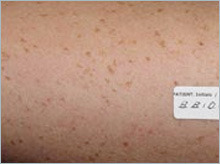 For veins and broken blood vessels, your skin will appear slightly redder after the treatment for 2-5 days. It’s fine to use make-up immediately after the treatment, providing it is applied and removed gently. It is rare, but for some people, bruising may occur, which will usually disappear within 1-2 weeks. You may have noticed some brown spots appearing on your face, chest, arms, and hands. Age spots. Find out where they come from, how to prevent more from appearing, and what to do about the ones you already have! “Age spots,” or “liver spots” are not caused by aging or the liver, but rather sun exposure. They are darkened brown, black, or grey spots that appear on areas that are most frequently exposed to the sun–hands, neck, face, chest, and hands. They are not painful, and more importantly, not dangerous or cancerous. That being said, skin discolouration of any kind should be checked regularly with a dermatologist to make sure that no cancerous cells are involved. Great news–age spots are found on the top layer of the skin, which means their appearance can be treated through several means. The first rule of skin care is always: Wear Sunscreen! Wearing a light UVA/UVB protected moisturizure all year and every year prevents discolouration, wrinkles, and skin cancer. Even if you may have age spots now, a combination of wearing an oil-free sunscreen and employing one of the treatments below will get rid of the spots while preventing others from appearing. Great skin is possible at any age, and the most important thing to know is that prevention is an ongoing process, and treatment is always an option. There are several options to treat age spots. Here are few of the pros and cons of the two most popular treatments for age spots: chemical peels and laser treatments. • Chemical Peel Chemical peels aid with discolouration and encourage growth of new top-layer skin cells. Along with sunscreen use, new skin cell production is key to young looking and balanced, healthy skin as dirt is removed and oils are stabilized. • Laser Treatment Laser rejuvenation will take longer to decrease the discolouration, but shows fewer signs of treatment afterwards. As chemical peels renew the top layer of the skin, the new skin will appear red briefly afterwards before showing the results of renewal. However, laser rejuvination takes more sessions to do. Both are safe and worth the results!